While at the marathon expo last week, I got the chance to talk to Al, a member of the Knoxville Track Club. I met him last year volunteering and is probably one of the sweetest gentlemen that I know in running. He is always encouraging and uplifting so when he tried to convince me to do a trail race with him I tried my best not to sound rude but made it clear that my answer was NO. I love to hike and all that jazz, but trail racing? No. The more we talked about it, the softer my heart got and by the end of the day I willingly agreed to sign up for a trail race. The only catch? It was exactly one week after the half marathon. That gave me seven whole days to pull my act together and figure out how I was going to do a dang trail race. Today came and basically it was only a matter of me showing up. So here’s the recap of my adventurous run in the great outdoors on a trail. Overall time: 1:49:51 on a 7 mile course. Likes: Beautiful afternoon, cheap race fee (5 bucks), a nicely designed tech tee, small crowd, and great post race food. The entire race was super low key. There may have been roughly 60 people there? Perfect for small trails. Race staff used a staggered start system based on age and gender. I’m not exactly sure how they determined who got to go when, but I wish I could have chosen to go last. Once I was out there I had to stop every few feet just so people could pass me. That got kind of annoying really fast. I was not concerned with my time in the least but I still opted to wear my Garmin just so I would have a working knowledge of how far I had gone. Let me just say that there were a lot of hills. I walked every single hill and had no shame in doing so. The first four miles were spent cursing Al for getting me into this nonsense. The course flattened out significantly after the four mile mark so I was happy about that. With no one in sight, it got quite lonely out there by myself but I was thankful for some peace and quiet. At one point I thought I had made a wrong turn since the sign telling me where to go was backwards, but a volunteer was there and informed me of the joyous news of only one mile left. Hoorah! I tried to run as much as possible the last mile and just finish before the course closed. Mission accomplished. I finished at a snail’s pace: 1:49:51 and only covered 7 miles. The finish line had lots of chips, bagels and gatorade. My tummy craved some sunchips so I gave in. I spent some time talking to Al and waiting on the one single person behind me to come in and finish. First (and probably last) trail race: complete! My main man, Al. We took a photo on a camera with no memory card so this is as good as it gets. 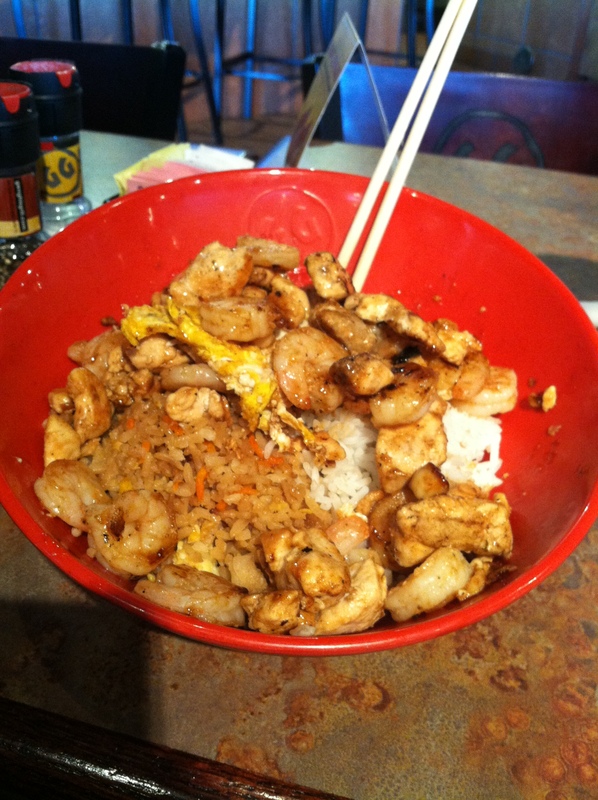 After I left the race site I went to a new restaurant, Genghis Grill. You get to pick whatever you want from the bar and they cook it in front of you. It was great refueling and apparently healthier than most stir fry places since they host a nationwide weight loss competition every year that makes contestants eat there every day. My friend Andrew was a part of it this year and lost 37 pounds in 2 months flat. Rock on, refuel. 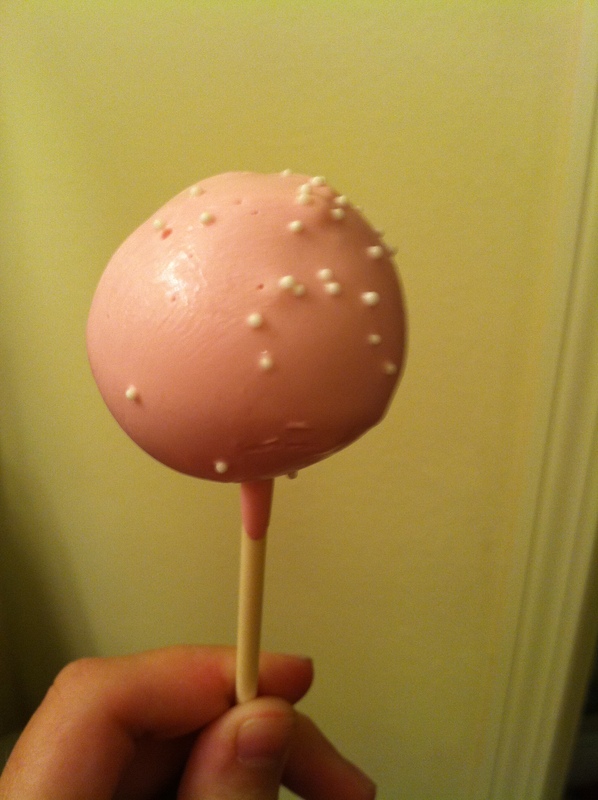 Oh, and since it was Easter and the Easter Bunny failed to visit my house (coughcough MOTHER), I swung by Starbucks and picked myself up a cake pop. I think it was well deserved. cake pop in celebration of birthday week. 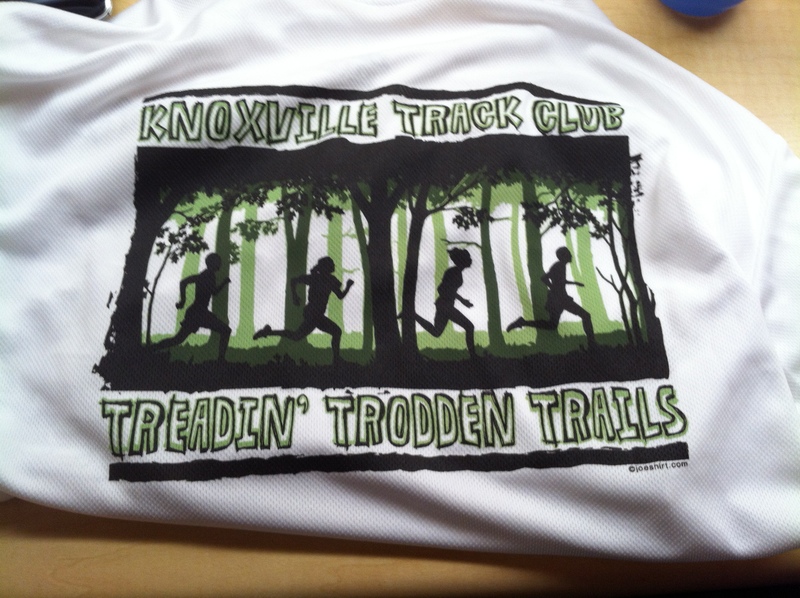 Have you ever done a trail race?? Or have you ever been hiking or ran on trails? What is your favorite way to refuel with a meal post race? Have you had a happy Easter?? Sorry Easter Bunny never got to Walmart this week. Way to go on race. 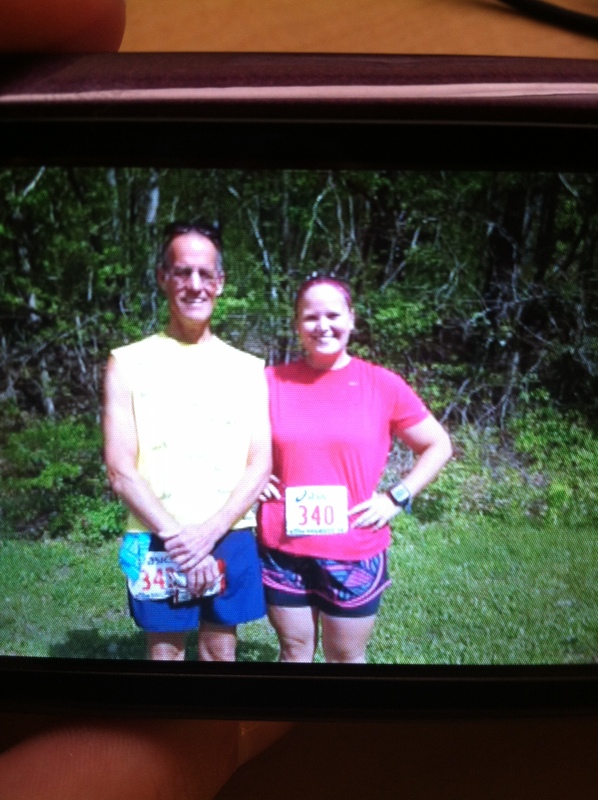 Awesome job on the trail race! Hey, if there’s another one for 5 bucks, let me know – it’s worth the gas to come up to Knoxville for that price! Sometimes it’s hard to see your time SO MUCH SLOWER on trails but you have to remember it’s the same for everyone. That’s what I keep telling myself, anyway! I just started to enjoy trail runs! I wish we even had nice trails here to change up the scenery a bit. I’m jealous that you have one that is a 7 mile loop. Try shorter runs on flatter courses and might start to enjoy it!